The philosophers Hume and Kant, in a frenzy of high conceit, helped to banish “testimony” from the modern world as a reliable source of knowledge. We want an idolatrous way of knowing that we think is indubitable. But we are finite, and so it has to be testimony or nothing. Jesus is Lord, so it is testify and live or languish and die. bought one some time ago and have read it from time to time so I have some further thoughts. I am not going to comment on the translation because the selling feature of the book is layout; other than say I grew up on the NIV (pre-update) and I like it. It is quite an easy reading version which probably helps a Reader's Bible. And I think that the NIV update made some improvements in translation but its gender neutral accommodations were unnecessary. 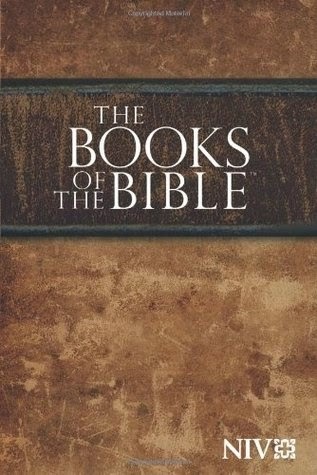 In general The Books of the Bible is a reasonable Bible to buy or use; I say this as I have several negative comments (of various levels of importance) below that may suggest otherwise. I wrote this current post before re-reading my earlier post and many of my thoughts before I bought the book turned out to be the case on reading it. The change in book order now seems less sensible. It is important to read the Bible in detail at times, but reading the Bible as a story, at least the specific books as a story, is just as important. While meaning can hang on a clause, a word, or even a tense; the larger context is vitally important and mitigates against over-interpreting. I am more likely to read larger passages of the Bible (1–3 chapters) at a time than a few verses so I am not certain that a Reader's Bible is as important to someone like me but I have heard that others are reading larger chunks of Scripture this way. As such, Books of the Bible is a useful addition. Single column. I would prefer all Bibles use a single column. I realise that because the Bible is over 700,000 words, creating a book-sized Bible can be difficult and various solutions include font size, font face, thin paper, and double (even triple) column. The column width is about 80 characters, I think readability would possibly be enhanced reducing this to 70 characters. Paragraphing. This should be standard for Bible and is common to my experience. I grew up reading paragraphed Bibles and infrequently read one divided by verses. That verse formatted Bibles are still produced makes no sense. Verses are solely for reference, not for interpretation. Speech. Dialogue is paragraphed in a modern format, that is, new paragraphs with a new speaker; the same format as one would find in a novel. Why some modern paragraphed Bibles do not do this is unknown to me. Poetry. The poetry is indented but the parallelisms are not indicated, that is the second line of verse is not indented further than the first. This is my preference as it allows the reader to decide on what are the parallels or whether they exist; some of the parallelisms in the dual indent system found in other Bibles seem forced or even mistaken. Stanzas are rightly separated by line spaces which is the equivalent of paragraphing in poetry. The only problem is that the NIV also uses a list format for some of its prose which is effectively formatted the same as the poetry; I am not certain of a good solution. Section headings. There are none. Not that I mind them but they shouldn't be in a Reader's Bible. Personally I think that section headings should be to the side of the text, and probably in a different font-face rather than bolded, italicised, or enlarged. I prefer chapter and verse numbers, even with this style of Bible. I think they can be made more indistinct by lightening them to grey, and making chapter numbers smaller and removing them from the textblock. I do not think verse numbers significantly affect my ability to read but I am aware that for many this can be a distraction. I once had a Bible with Strongs numbers* attached to various words and coding for tenses of verbs, as well as verse numbers, footnotes and cross references. A friend found my Bible impossible to read and couldn't understand how I could: I just ignored the numbers and letters when I didn't need them. No red letter. I don't have strong views on this. It is probably preferable for a Reader's Bible. First Testament. This is the name given to the Old Testament. Though I don't mind it I think it unnecessary. We have the New Testament, Jesus describes the new covenant in his blood, and refers to new wine and old wine. Thus Old Testament is accurate and not in anyway disparaging. Endnotes. I generally hate endnotes through a book (usually at end of chapters). Footnote or back of entire book for me, preferably the former. The benefit is that the footnotes do not distract you, the negative is that when you want to find the note it takes time to find the endnotes for the book and then the specific one on the page, reading through them all to find the passage (notes are not numbered). Probably the right decision but a hassle if you are a regular reader of footnotes. Paragraphing. 4 levels of paragraphing! Intent, line space times 1, 2 and 3. 3 line spaces is also followed by a dropcap for the new paragraph. How do they justify this? 1 level of paragraphing is adequate and at the most 2: indent and single line space. And no capital words or dropcaps. Book order. The Old and New Testaments are completely rearranged. Now I have some sympathy with placing the Old Testament in the order from the time of Christ and grouping them into the Law, Writings and Prophets. The Books of the Bible groups them differently using History, Prophets and Writings and includes several books in History that the Jews would include in the Prophets or Writings (such as Judges and Ruth). But the New Testament order is completely unhelpful. Firstly it is difficult to navigate without the contents because the order is unfamiliar. But the order is not overly sensible. One could go with the traditional order or the Greek Orthodox order. But they group them around the gospels and this is forced in places. Luke is grouped with Acts (sensibly) but also all of Paul which therefore accounts for the bulk of the New Testament. Paul's letters are chronological which could be helpful. John is grouped with his letters and Revelation (makes sense). Mark with Peter's letters (Peter source of Mark presumably) and Jude (probably due to similarities with Peter). Matthew with James and Hebrews because they're left over. But Hebrews would be better with the Lukan section. The letters are not like the gospels. And if another gospel is going to oust Matthew for pole position why Luke? Mark if they think it written first or, better still, John for its parallels to Genesis. Number of books. This just fails. Samuel, Kings and Chronicles were single books that were split in the Septuagint. I have long thought that in modern Bibles these 6 books should be 3. The Books of the Bible starts the process then joins Samuel to Kings (why) and Chronicles to Ezra and Nehemiah. Luke is adjacent to Acts and Acts is titled separately but they are incorrectly considered a single book in the contents. Name. The Books of the Bible. Really! It does show up in an internet search but most of the results are tables of contents for the Bible.